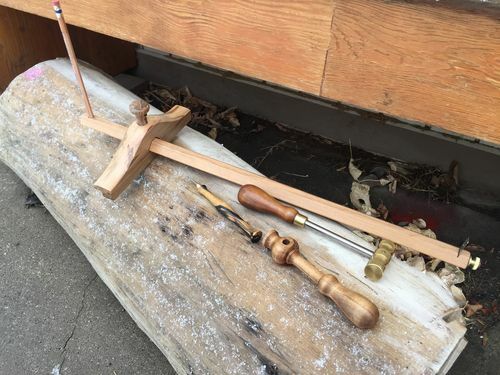 This was my submission for the winter 2017 tool swap that went to Lj jeffswildwood. 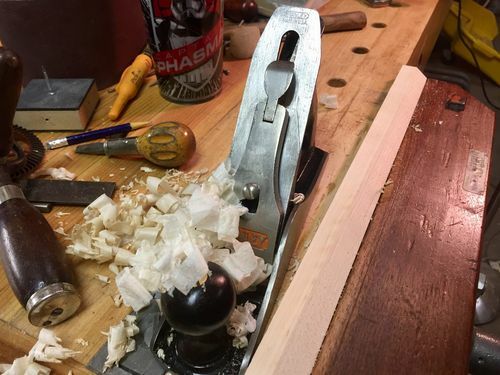 I decided on the panel gauge because I needed one and hoped someone did too. I took a lot of good ideas and features from traditional and new designs and made a really nice to use tool. I chose the classic Stanley No. 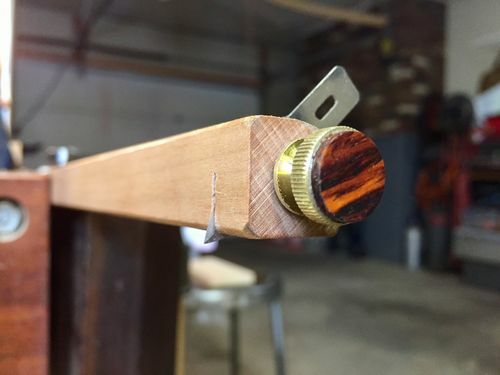 85 head profile in Ambrosia maple and turned and threaded the beam screw to match. 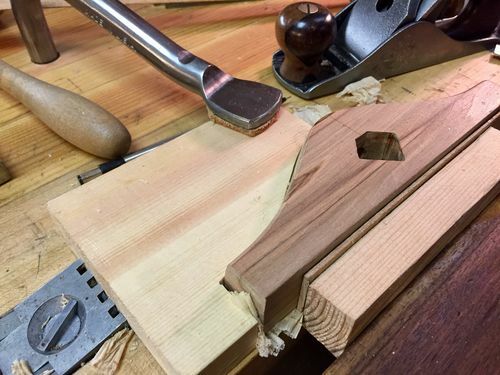 I made the hickory beam to lock in its V shaped mortise to eliminate any racking at length. A simple spear point exacto blade on one end and a threaded hole for a common pencil on the other. 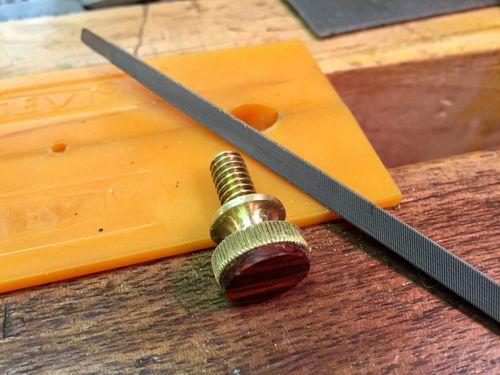 I also made a pencil threader to accompany the gauge. I am very happy with how it came together and it works beautifully. I made templates and there will be another for myself soon! I really hope Jeff will find it a joy to use and own. As a bonus, I turned a marking Scrawl in black and white ebony using a kit from Blackburn Tools. I love and reach for mine constantly. I threw in a Goodell-Pratt reproduction No. 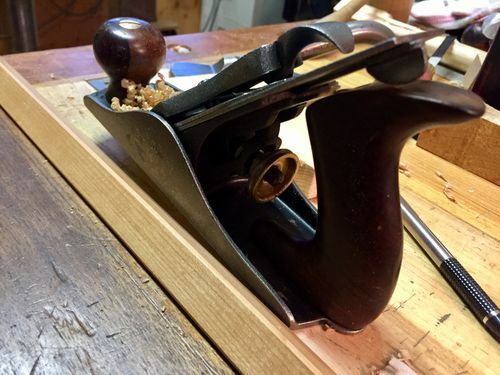 93 brass hammer in rosewood I made a run of last year. Thank you for looking. Some build pics. Nice tools. Well done, and should be well appreciated. Awesome job all around on this one Woodcox. I’m sure Jeff is tickled with all of it! The pencil threading tool is one of the coolest and most original things I saw in the whole swap. Top-notch craftsmanship all the way around! I’ve made a couple of “scrawls” for myself and one for the swap before this one. 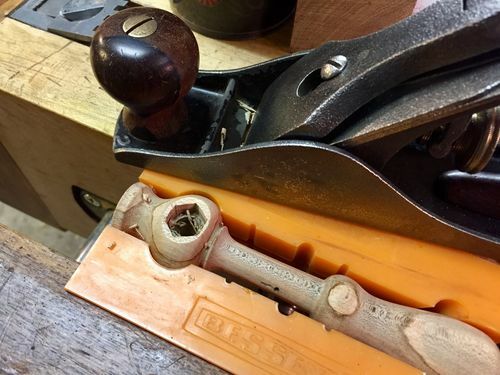 I never knew they were called that but I agree, it’s one of my most used tools too. Mitchell, you have no idea how happy I was with this set. Seeing the amount of work that went into these is incredible. Since I received these, they have been used on a regular basis. The “scrawl” has become my go to tool and I can’t figure out how I got by without one. Beautiful work and thanks for the wonderful set! How did you make the slot for the blade? I presume the knurled bolt passes through an inserted bolt, and then presses against the blade to keep it in place. 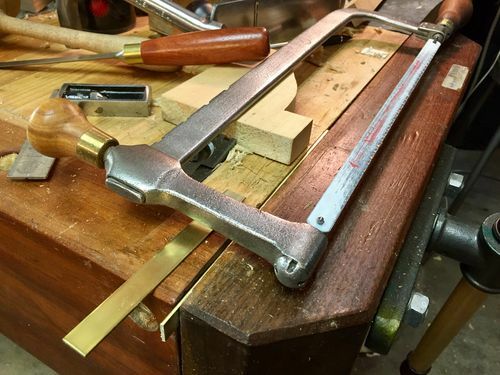 This shop built panel gauge is a beautiful tool and so nicely done. Congratulations. Beautiful work woodcox and appreciated by all, especially jeffswildwood. Lots of wonderful details and craftsmanship here. Very nice. Thank you for all of the nice comments. Will, I drilled a row of small holes and knifed the waste in between. 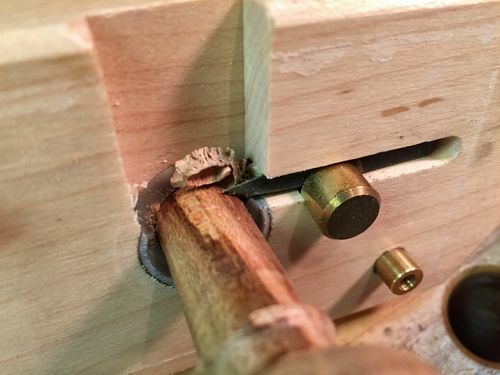 How did you make the wooden screw and thread the hole? 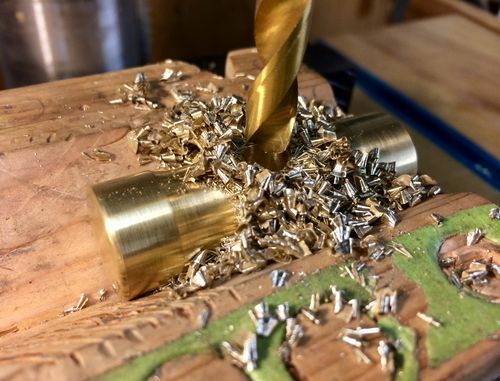 Looks like a custom thread cutting tool in the one picture? 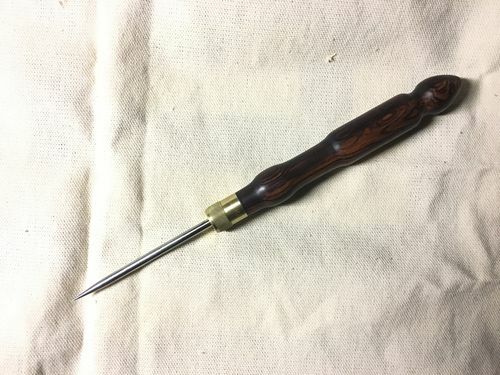 Wooden screws fascinate me, and now that I own a small lathe I’d really like to try to make a few. Just haven’t decided how best to do that yet. Jeremy, I used an import 1/2” thread box kit. 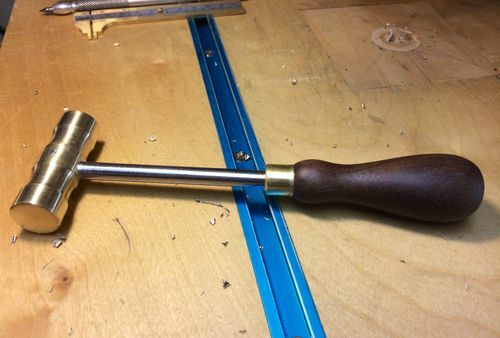 I turned the knob profile on the lathe and then the shank to 1/2” ,box end wrench to fit. The threading box can be partially disassembled after you get it started to cut closer to an obstacle. After honing the iron by hand, easy. A little fettling and they will likely do what you need. I needed the optional bottoming tap for another project and an extra iron just in case. 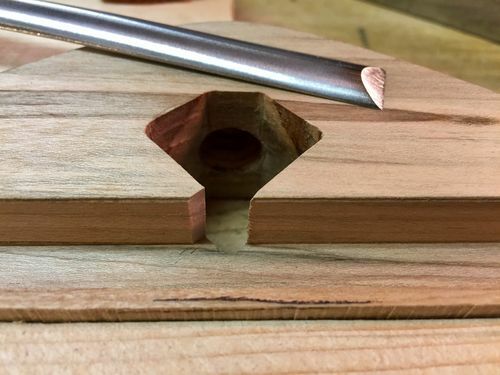 Threading 1/2” dowel stock in hardwoods well so far. Dang woodcox. Nice workmanship. Excellent.